The Amiga Kickstart v1.0 image created by Sheryl Knowles in 1985. It consists of 4 colors and is in lowres. Why is the Kickstart disc in the left hand when the disc drive on the Amiga 1000 is on the right side? In 1985 the Amiga 1000 came to life. With it the Amiga Kickstart v1.0 and the Amiga Workbench v1.0 also came into our lives. All of us who´s been around an Amiga in the 80´s or the 90´s are familiar with the Amiga Kickstart logo (the left hand holding a disc) but are we all clear about why the disc is held in the left hand? Sheryl Knowles created the Kickstart logo image in 1985 upon the release of the Amiga 1000. Sheryl Knowles, the artist behind the Amiga Kickstart logo image, was right handed and when creating the logo itself she held the disc in her left hand drawing it with the right. The Amiga 1000 and also the predecessors Amiga 500, 600 and 1200 all have the disc drive on the right side of the housing. The Amiga 1000 needed a Kickstart disk to be inserted into floppy drive to boot up. 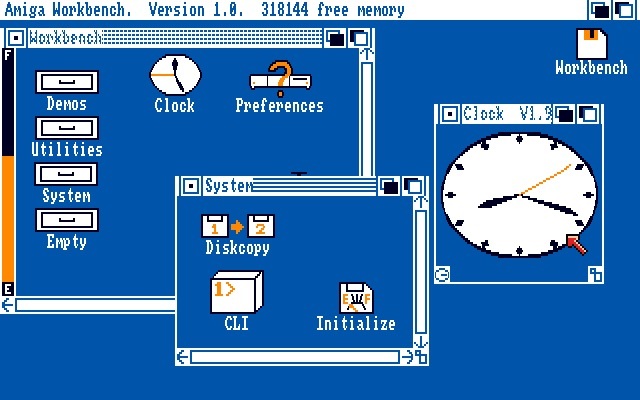 An image of a simple illustration of a hand on a white screen, holding a blue Kickstart floppy, invited the user to perform this operation. Workbench v1.0 for the Amiga 1000 released in 1985.